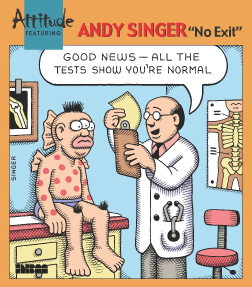 ATTITUDE FEATURING: ANDY SINGER "NO EXIT" is a 128-page selection of my cartoons from 1992 to 2004, edited and introduced by fellow cartoonist Ted Rall. ISBN 1-56163-408-5. It is the first book of a series by NBM publishing. Each book highlights a different cartoonist from their "ATTITUDE" compilations.